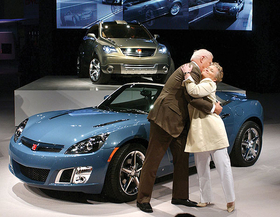 GMs Bob Lutz and Saturns Jill Lajdziak celebrate the new Saturn lineup at the 2006 New York auto show. DETROIT — Bob Lutz says General Motors' struggling Saturn brand probably won't survive. "My personal favorite would be to see Saturn survive and prosper," GM's vice chairman told Automotive News. "But frankly, the reality is that that is probably not going to be the outcome." He added: "We spent a huge bundle of money in giving Saturn an absolutely no-excuses product lineup, top to bottom. They had a better and fresher lineup than any GM division, and the sales just never materialized. So we have to act on that. It's our duty." New Jersey Saturn dealer Stuart Lasser took Lutz's comments as confirmation of his worst fears. "That really seals our fate," said Lasser, owner of Saturn of Denville, Saturn of Mount Olive and Saturn of Livingston. "I think they knew this fact months ago, and they never shared it with us." Lutz, who announced last week that he will retire by year end, said GM lacks the time or resources to help the brand make a comeback. On Dec. 2, GM told Congress it will focus most of its resources on its "core brands" — Chevrolet, Cadillac, Buick and GMC — and make Pontiac a niche brand with one or two products. That left Saturn, Saab and Hummer in the cold. GM put Hummer up for sale in June. Saturn and Saab are under review. GM has told Saturn dealers that it has allocated funds to build Saturn vehicles through 2012 and in some cases 2013. But it has not committed money to future products. Saturn's sales fell 21.7 percent to 188,004 in 2008. GM had hoped to sell about 100,000 units annually of the Aura sedan, the 2006 North American Car of the Year. But the car hasn't come close to that target since its August 2006 launch. Last year 59,380 were sold. Lutz doesn't fault dealers: "We have some very excellent Saturn dealers who've made a commitment to the brand." Some Saturn dealers say GM damaged the brand with its Dec. 2 announcement. "I would agree with the comment that saying that Pontiac is under review probably had some impact on Pontiac sales," Lutz said. "Saying that Saab is under review probably had some impact on Saab sales. "But the lack of Saturn sales has been ongoing for a couple of years," he added. "The Aura never really made its volume commitments, the Vue is halfway there, and the Outlook has not done nearly as well for Saturn as the Buick Enclave and GMC Acadia." Lutz said he isn't sure why Saturn has not done better. "The fact is," he said, "we don't have the time or the resources to take 10 years to figure it out and possibly turn it around."